Here is a silk banner of mine which has the Eight Auspicious Signs on it. Here are the Buddhist Symbols seperately. Clicking on each will bring you to a larger image and an explanation for you. 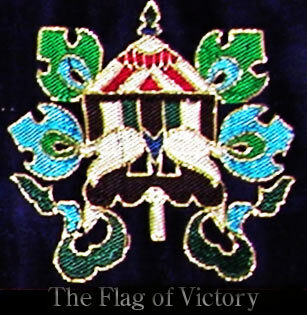 The Flag of Victory,in Sanskrit the Dhvaja. It symbolizes the victory of Buddhist teachings over ignorance. It announces that all spiritual obstacles have been overcome and that good fortune has arrived. At the end of a long hard week in class he'd come down to the local watering hole that some of us had taken as our own. BW3's on Friday after class was where we would grab some hot wings, some happy hour beer and Curtis, Johanna, Shaun, others, we'd pull some tables together, enough to accommodate however many of us would show up. Andy would laugh with us and we'd talk about what funny things happened in class. Sometimes he'd get a bit excited, a beer or two down the evening and when he wanted to say something and his words were tripping around on his tongue his eyes would sparkle and the smile on his face would broaden as if to acknowledge that he thought he was being a bit foolish or silly. But we would slap him on his back, laugh at his jokes and generally do the things that friends would do with each other as we recognize everyone who would want to be in the conversation and who would likewise have a patience and joy with us.